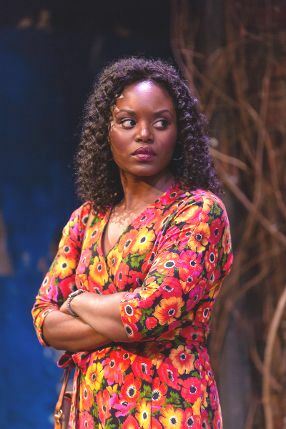 In the play running through December 16 at Two River Theater in Red Bank, NJ, a 35-year old African-American woman defends her decision to terminate her pregnancy in an impassioned speech. “I ain’t raising no kid to have somebody shoot him. To have his friends…or the police…shoot him,” Tonya says, before relating the gut-wrenching story of a neighborhood mother whose son was shot and killed even as she had his favorite meal on the table. So…an angry, socially conscious play written in the wake of the #BlackLivesMatter movement, right? Wrong. “King Hedley II” was written in 1999. 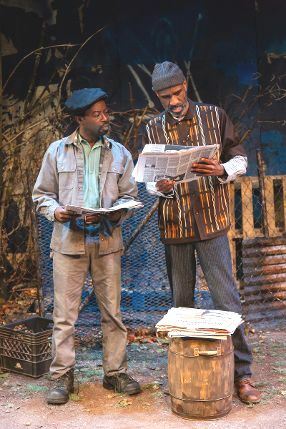 Set in 1985, it is one of August Wilson’s ten Century Cycle plays that examine “the unique particulars of black American culture” (Wilson’s phrase) through the twentieth century, decade by decade. It is a masterful work, and in Tonya’s and others’ speeches and in their interactions with the world around them, it is eerily prescient. “Hedley” plays out in the back yards of two adjacent rundown houses that could not look any more lived-in, thanks to Michael Carnahan’s site-perfect set. 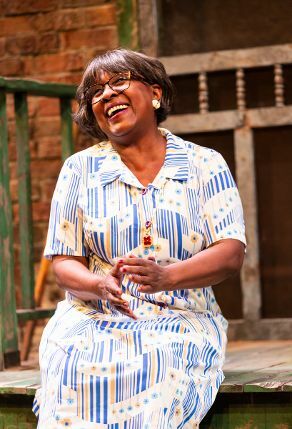 In Two River’s intimate second space, the audience is virtually in those back yards with the actors, or, better said, with the characters, who are no more than 15-20 feet away. King Hedley II (Blake Morris), having served seven years for a second-degree killing, lives with his mother Ruby (Elain Graham) and wife Tonya (Brittany Bellizaere) in Ruby’s house. Their next door neighbor is 65-year old Stool Pigeon (Stephen McKinley Henderson), so nick-named by Ruby years earlier, when he revealed a neighborhood secret “and somehow or other it stuck.” He interacts some with the others, but functions mainly as “the spiritual and practical truthsayer” of the Pittsburgh Hill District, where this (and all but one other of the Cycle plays) is set. Mister (Charlie Hudson III) is King’s best friend and sometime business partner. Currently they are selling refrigerators (of dubious origin). 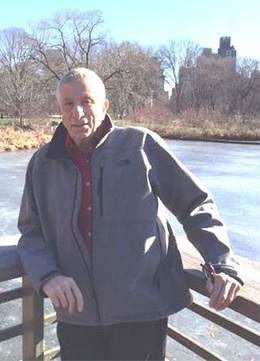 Elmore (Harvy Blanks), a professional hustler, is Ruby’s longtime, but sporadic, flame. As family, friends or neighbors, the six characters have known one another for years, a factor self-evident ten minutes into this wonderfully acted and directed production. King Hedley, by the way, is his name, not a designation, although the metaphor is certainly not accidental. In his own mind he is indeed royal – even sacred, dreaming a halo over his head. So internal is Morris’s performance that when he asks others if they see his halo, you sort of do. The play is an un-glamorous exploration of some real hard-knock lives, but like all of us (we hope), they find – and communicate – humor in their situation. That situation involves King’s pipe dream of opening a video-rental store with worshipful (of King) Mister, played just right by Hudson; Elmore’s thinly-veiled menace, played by Blanks at the edge of scary; Ruby’s maternal concern, instinctually conveyed by Ms. Graham; and the marital tension between King and Tonya, exquisitely acted by Ms. Bellizeare. Stool Pigeon hovers over the proceedings, preaching, but also leavening the play with some amusement, which Coats communicates without exploiting S P’s derangement…like a fox. Each character has aria-like speeches of varying lengths that reveal their root personalities and their frustrations with dreams deferred. In Wilson’s genius, the vernacular evolves into poetry. An actor of distinction himself (Two River’s “Raisin in the Sun” for one), Brandon J. Dirden has directed the play with a sure hand. 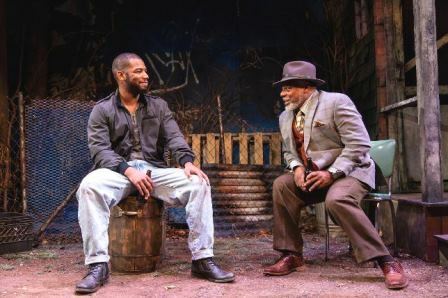 As real as the characters and situation are on August Wilson’s page, Dirden and company imbue them with an even deeper reality on Two River’s stage. This is the fifth of Wilson’s plays for Two River Theater, whose plan it is to eventually complete the Cycle. “King Hedley II” is not the most widely produced of the ten. 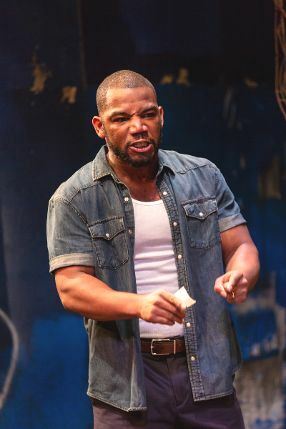 In fact, it has been referred to as relatively minor August Wilson, but anyone who reads or watches today’s news – today’s – cannot deny the power written into this play. Variously lauded as “the American Shakespeare” and “the Shakespeare of the 20th Century” for “the handsomness of his lyrical language,” August Wilson died of cancer in 2005 at age 60.